We Know Our Clients’ Names! Make sure you have the right coverage before you need it. Insurance Town and Country is Denver’s premier independent insurance agency. We work hard to match our client’s with a policy that meets their needs at the lowest possible price. We offer business insurance from commercial property to general liability, commercial vehicle, commercial umbrella, HOA, inland marine, professional liability, workers compensation, group health, criminal insurance, bonds, special event and business owner policy choices that fit any size of business or industry classification. Our personal insurance lines range from car insurance, boat, RV and motorcycle insurance to homeowners, renters, flood and personal liability policies. We search through multiple carriers to provide insurance solutions for you or your small business in health insurance, life insurance, pet insurance and even identity theft insurance. Just as ignorance of the law is no excuse for breaking a law, not knowing that you need insurance coverage for a business or personal area of liability is no excuse for not investigating what you need to protect yourself and your family from harm and loss. There are so many options to consider when shopping for insurance coverage. Our independent insurance agents are highly trained and offer a level of personalized service that’s difficult to find in today’s crowded impersonal marketplace. We put our carriers to the test when we shop your coverage by comparing coverages and rates. We carefully select financially sound and reputable insurance providers. We offer quality insurance products and renowned customer service at competitive prices. That creates value for our customers and that’s why so many Insurance Town and Country customers are customers for life. 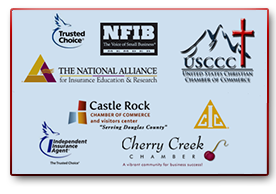 Insurance Town & Country proudly provides insurance solutions to business and personal insurance clients throughout Colorado from our offices in Denver and Castle Rock. Give us a call today at 303-388-7216, email us or come in and see us in person. We love to answer your questions and will take the time to make sure you are comfortable with the insurance solution that’s best for you.